Lamb can be a seasonal product but, by sourcing lamb from our own farm and from other local farms, we are able to ensure a consistent supply of quality lamb throughout the year, even in the late winter months. We produce lamb from the Welsh Mule/Lleyn breeding ewes crossed with a Beltex ram to produce the shapely, meaty lamb we pride ourselves on. We are able to supplement our own supply from other farmers in the Ystwyth Valley who produce lambs to our specification, using an agreed breeding and feeding programme. We pride ourselves in farming in such a way that all lambs are reared slowly and gradually on grass, with a little concentrate, as required. Our lambs are hand-selected by Rob who will select lambs that provide the meatiest joints, with depth of meat and good eye-to-loin, and a light covering of fat. Lambs are slaughtered at the local abattoir at Tregaron and hung at our own Butchery for 7-10 days to mature. 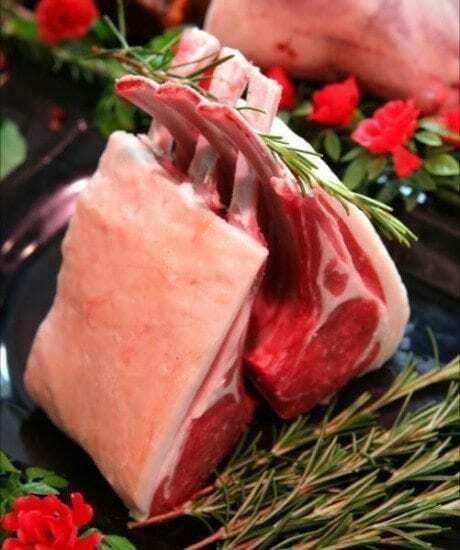 This process will maximize tenderness and flavour, and together with the light covering of fat, will ensure the meat remains moist and succulent during cooking, giving the tastiest possible lamb on the plate. “I go to Rob Rattray for gorgeously fatty Ystwyth Valley lamb from his own farm, to slow-cook for the restaurant and to eat at home. He’s an incredibly talented guy, a real support and great to work with. The lamb in Wales is the best in the world – there’s no doubt about it.” says Gareth Ward of Ynyshir Restaurant and Rooms in his interview on Local Heroes in The Telegraph on 29 September 2018.